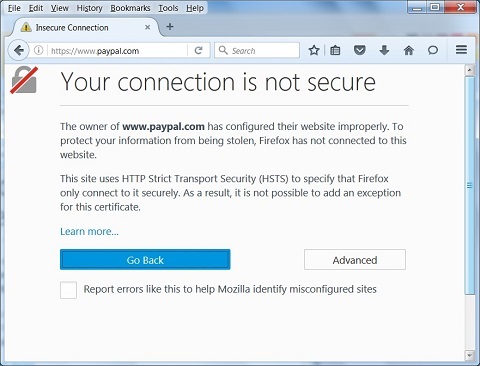 Why I am getting the "Your connection is not secure" error screen in Firefox? 1. Run Firefox and go to "Tools > Options" menu. 2. Click "Advanced > Certificates" tab and "View Certificates" button. 3. Click "Authorities" tab and select "VeriSign Class 3 Public Primary Certification Authority - G5". 4. Click "Export..." button to save a copy of this CA certificate to a file called "VeriSignCA.crt". 5. Click "Delete or Distrust..." button to delete it from Firefox. 6. Close Firefox and start it again. The owner of www.paypal.com has configured their website improperly. to add an exception for this certificate. You know why. Because you deleted the root CA certificate from Firefox. Don't worry, you can import it back to Firefox by following the other tutorial.